You all know that my baby is already a 5 foot tall 11-year old, right? Well, sometimes, I play mommy to a little girl who calls me "Nyanyan." Tiki, the baby niece I wrote about last year, is now one year and three months and is a walking brownie monster, LOL! Somehow, she's lucky to have me as her aunt because she gets to try all the baby products sent over to me for product review. It was a hot humid day last Tuesday so my sister and I let her take a bath in a palanggana (basin) in the garden. (Times like this, I wish I saved Rap's inflatable swimming pool.) Nevertheless, it was the perfect time to try out the NIVEA Baby Sensitive Care products that were sent to me by NIVEA Baby Philippines. Of course, bathing should be from top to bottom so we started with NIVEA Baby Extra Mild Shampoo. It's hypoallergenic, ultra mild, and has a tear-free formula which is perfect for very young babies. What I particularly love about this shampoo is that it has natural chamomile that left Tiki's fine hair soft and sweet-smelling. After rinsing, soaping with NIVEA Baby Nutri Sensitive Milk Wash was next. What makes this product different from the rest is its natural Omega-6 lipids that come from sunflowers. These lipids then replace the lost lipids of babies especially those with very dry and sensitive skin. Actually, you can also use this to soap baby's face and hair. We also had a bar of NIVEA Baby Soothing Avena soap which has natural oat extracts and coconut oil for extra moisture. This one, I opted to save for Rap because his fingers are currently suffering from eczema. Between the two, the milk wash feels more silky to the skin. It's like you've already applied lotion on baby's skin. Speaking of lotion, Tiki's last bathing treat was NIVEA Baby Nutri Sensitive Milk Lotion. It has the same Omega 6 lipids as the Milk Wash and the scent is also the same. So with the milk wash and this milk lotion, baby's skin will surely be moisturized the whole day. By the way, NIVEA Baby Philippines has a very interactive Facebook page. Their Facebook page is especially beneficial to moms of babies because it has the NIVEA Baby Caring for You Journal. Via the app, moms can keep track of their babies' milestones based on the specific monthly theme. Moms can expect seeing a product guide, baby gallery, baby's journal, sharing, and rewards features within the app. Update your baby journal weekly and have the chance to win a NIVEA Baby gift pack for having the best baby photo of the week. Visit http://www.facebook.com/NIVEABabyPhilippines and make your baby journal today! my son is a Nivea Baby too. 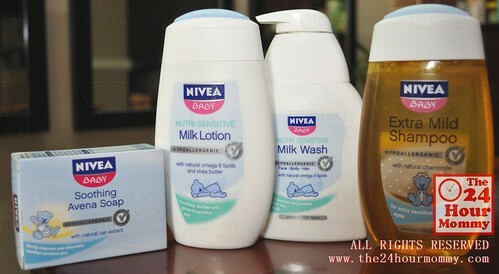 he is using the Nivea Baby Tenderly Caring Cream Soap and Nutrisensitive milk lotion. I'll try the milk bath and their extra mild shampoo too. i did not know that Nivea has MILK bath!! good to know.. yey!! i remember trying out Nivea for my little kids too.. it is very gentle on the baby's skin.